W., Christina (2005) Peranan dukungan istri terhadap coping stress rohaniwan Kristen Protestan. Skripsi thesis, universitas Tarumanagara. 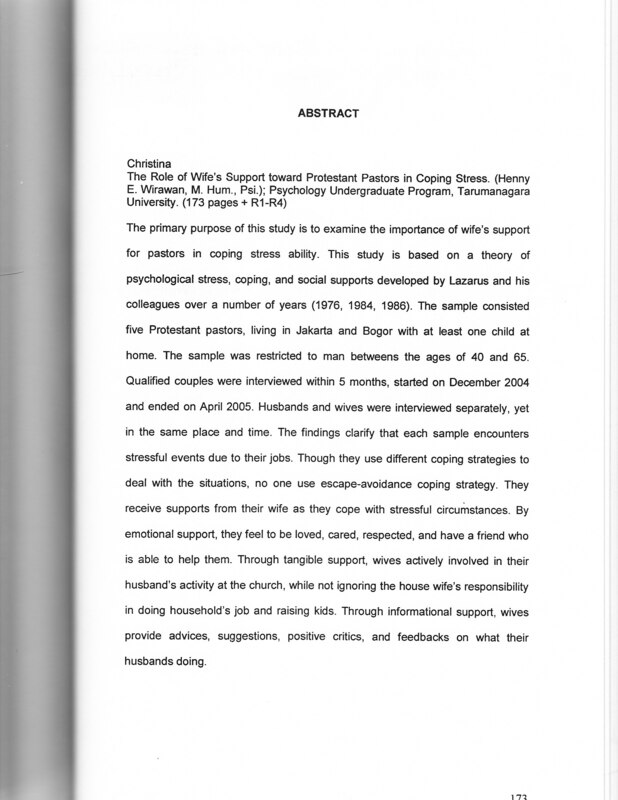 The primary purpose of this study is to examine the importance of wife's support for pastors in coping stress ability. This study is based on a theory of psychological stress, coping, and social supports developed by Lazarus and his colleagues over a number of years (1976, 1984, 1986). The sample consisted five Protestant pastors, living in Jakarta and Bogor with at least one child at home. The sample was restricted to man betweens the ages of 40 and 65. Qualified couples were interviewed within 5 months, started on December 2004 and ended on April 2005. Husbands and wives were interviewed separately, yet in the same place and time. The findings clarify that each sample encounters stressful events due to their jobs. Though they use different coping strategies to deal with the situations, no one use escape-avoidance coping strategy. They receive supports from their wife as they cope with stressful circumstances. By emotional support, they feel to be loved, cared, respected, and have a friend who is able to help them. Through tangible support, wives actively involved in their husband's activity at the church, while not ignoring the house wife's responsibility in doing household's job and raising kids. Through informational support, wives provide advices, suggestions, positive critics, and feedbacks on what their husbands doing.